Anaheim, CA – Bluefin, the leading North American distributor of toys, collectibles, and hobby merchandise from Japan, Asia and more, heads to New York City this month and announces its participation at Toy Fair 2018. For this year’s show, Bluefin will exhibit a wide array of unique collectibles, including action figures, model kits, statues and modelling accessories from leading companies such as Bandai Hobby and Mr. Hobby, SEN-TI-NEL, Iron Studios, Flame Toys, and Storm Collectibles. Toy Fair 2018 takes place Feb. 17-20, 2018 at the Jacob K. Javitz Convention Center in Manhattan, NY and is a leading annual industry event produced by the Toy Industry Association™, Inc. (TIA), a non-profit trade association representing all businesses involved in manufacturing and distributing toys and youth entertainment products to consumers. TIA’s more than 900 members account for approximately 90 percent of the annual U.S. domestic toy market of $22 billion. Show details are available at: http://www.toyfairny.com. Flame Toys Transformers “Drift” High-End Action Figures · MSRP: $299.00 · Available Now! Now available, this extraordinary rendering is officially licensed and depicts the Autobot, Drift, as depicted in the beloved IDW Transformers comic book series. The Drift figure represents the pinnacle of collectible design. He stands 8 inches tall and is constructed with high quality die-cast parts with more than 50 jointed linkage articulation features to allow for maximum realistic poseability. A must-have for any ardent pop culture collector or Transformers fan. The (non-transforming) Drift figure also features 3 interchangeable facial expressions and contains 6 LED units that provide light-up displays on its body. The LR batteries required for this figure are included. Finally, Drift contains 3 sword weapons and a cape that is accented with bendable wires that allow for dramatic, anime-style windswept poses. During Toy Fair, Bluefin will also highlight future Flame Toys Transformers releases including Tarn and Star Saber who will also be on display for the first time in the U.S.
New from Iron Studios are its latest highly-detailed, 1/10 scale Polystone statues of popular DC and Marvel superhero characters. For Toy Fair, Bluefin will highlight releases for Spider-Man: Homecoming, Thor Ragnarok, Black Panther, Assassins Creed and Batman & Robin -Frank Miller Edition for "The Dark Knight Returns." Each statue is hand-painted and presented ready for battle. and can be connected to create a kinetic diorama. New from SEN-TI-NEL comes the Super Hero Illuminate Gallery Collection. 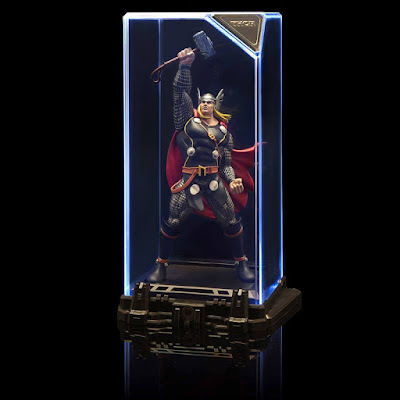 Each superhero is encased in a 7-inch tall acrylic display box that features LED lights that are motion activated. Collectors can choose between 2 settings – static and motion detected. Available releases include Captain America, Spider Man, Thor, Vison, Iron Man and Ultron. Catch a highly detailed 1/12 scale release of Shao Kahn, the very embodiment of evil from the world of the landmark Mortal Kombat video game. Poseable figure features a variety of accessories including his iconic throne. Heihachi Mishima is one of the main characters from the Tekken video game series and has appeared in all incarnations of the game. The new 1/12 scale action figure from Storm Collectibles will resonate with pop culture and gaming fans as there has not been a collector’s grade release of any character from Tekken 7 in a long time. Bluefin will also showcase future releases from the Storm Collectibles Tekken line-up during Toy Fair. During the past year, Storm Collectibles has built a name for itself as a premiere brand for fighting game action figures. For 2018, fans can look forward to releases for Ultra Street Fighter II, The King of Fighters ’98, Tekken 7 and Injustice (1 & 2). Based in Anaheim, CA, Bluefin built its reputation as a leading distributor of Japanese toys, collectibles, novelty and hobby products. In recent years, Bluefin has grown to include a range of high quality collectible lines from the United States, Hong Kong and Taiwan and established itself as the official North American consumer products and retail development partner for Studio Ghibli. Selling to thousands of specialty, chain and independent stores, Bluefin is an official North American distributor for Bandai Hobby, Bandai Shokugan, and Capcom, and is also an official provider of Bandai Tamashii Nations products. Bluefin the exclusive and official distributor for Blitzway Studios, Flame Toys, Mr. Hobby, SEN-TI-NEL, Storm Collectibles, and X-Plus. Bluefin also represents TruForce Collectibles products worldwide. Additional information is available at: www.bluefincorp.com. "Hunter x Hunter: Phantom Rouge"